This case may have contained a missal or prayer book. The high value of personal possessions such as books, documents or knives encouraged the use of protective cases which could be carried on a belt for convenience. These were moulded and stitched in leather, and were close-fitting and light-weight. They are exceptionally durable, and have often outlasted the contents. Integral loops allowed the lids to be secured with a cord or thong. Such cases are sometimes depicted in 15th-century paintings and manuscript illuminations. They could be intricately decorated with fashionable ornament, personalised inscriptions and colour. CASE FOR A SERVICE BOOK. Thin wood stiffening covered with sewn leather of brown colour, with tooled and coloured (red and white) decoration. With a thin red leather lining. Rectangular form. Shut-over cap and embushment (opening) with thumb cut-outs by which to grip the volume for which the case was made. On top of the cap, paired lilies enclosed within spirally coiled stems. At the ends of the cap, paired lilies enclosed within spirally coiled stems. At the ends of the cap, a pair of loops corresponding with eyes on the container, for a missing strap. On obverse and reverse, within a Gothic cartouche, shields of arms identified as Châtillon impaling Vergy, all enclosed within a pattern of six spirally coiled stems, each enclosing a flower, alternately lily and sunflower. On the ends, formal patterns. On the base, diagonals, and compartments each containing three cinquefoil leaves. Interior of cap, and of container, including both sides of the embushment lined throughout in the original soft red leather (considerably worn). Red and white paint traces on various areas of the missal case were analysed non-destructively and in situ by EDXRF. The elements found (mercury and lead) are in agreement with the use of traditional pigments such as vermilion and lead white. No metals suggesting the presence of modern pigments (such as cadmium, chromium, titanium and zinc) were detected. Illus. in Gall, Leder in Europäischen Kunsthandwerk, p.108, fig.77 where this case is related to a book case and a container for ivory objects (both formerly Spitzer collection, fig.76) and a knife-case in Berlin (fig.75) on account of its hanging blossom motif, and treatment of a coat of arms - which are attributed to the same workshop in France or Burgundy, even though the ivory object contained in one of the group originated in Italy. CASE FOR A SERVICE BOOK. 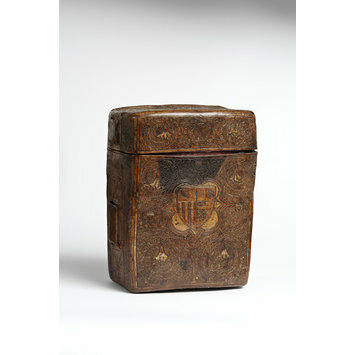 Wood covered with boiled and sewn leather of brown colour, with tooled and coloured decoration. Rectangular form. Shut-over cap and embushment. On top of the cap, paired lilies enclosed within spirally coiled stems. At the ends of the cap, paired lilies enclosed within spirally coiled stems. At the ends of the cap, a pair of eyes corresponding with eyes on the container, for a strap, long wanting. In 1925 the late Albert Van de Put, Deputy-Keeper of the Library, whose knowledge of confidential heraldry was without rival stated that the arms of the Châtillon impaling Vergy were not represented by any alliance between these families. The suggestion was in consequence made that this case was a forgery. The exterior surface of the leather and its workmanship and condition, as well as the fabric and worn (not distressed) condition of the lining, put it beyond question that this suggestion was erroneous. It is, however, possible that the cartouches, originally left blank for legend or device, were subsequently completed by an adventitious coat of arms. “Cuir-bouilli” case for book (Italian) A leather box (Castellani Coln) £21 ‘fetched £48 at that sale’. It is possible that this refers to this object? It is possible that his interest in leather began, like his interest in renaissance furniture begins during 1884 (after the Spitzer sale, 1883 at which he was said to have spent £35,000, and the Fountaine sale, 1884). 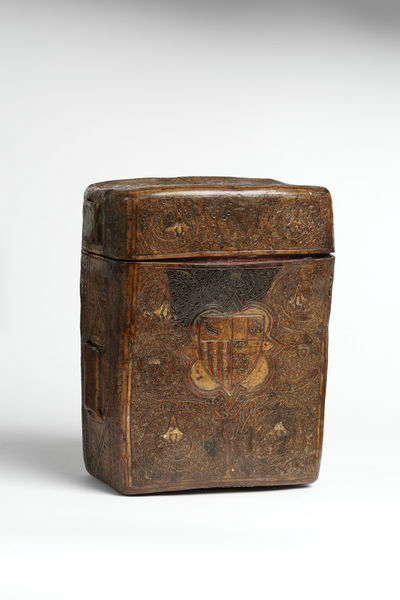 The high value of medieval books led to the creation of fitted leather cases to protect them. This case may have contained a missal or prayer book, while other similar cases are recorded likely tohave contained a medical text of some sort (catalogue no.190). The integral loops on the case and lid of this one would probably have been used to fasten them together, and by which to carry it on a belt. P81. Etui in medieval inventories and accounts was a general term for storage or travel containers of various materials and sizes… A large leather case, ordered from a coffret-maker and referred to as an etui de cuir bouilli, was purchased to hold a painting by Jehan d’Orléans, painter to King Charles VI of France…References are also made to small etui of cuir bouilli which were designed specifically to be attached to one’s costume. Used to carry quill pens, ink wells, books, cutlery, and other personal possessions, these objects are frequently depicted in 15th century paintings and manuscript illuminations. Missal case and lid, moulded leather.